Weather permitting, Bouchon provides outdoor dining with a view of the pool deck at the Venetian Hotel Resort and Casino. That pool deck is graced with multiple gazebos, columns that are connected in an arch by rambling greenery, the pool - obviously - and a wonderful circular fountain. 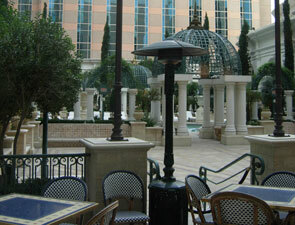 On a hot day, try to grab a table next to the fountain; you'll forget you're in the heated desert. The blue square tables are framed in gold color and have a thicker, beige-colored frame that contains the word "Bouchon" on each side. While the round tables are beige, they are framed in gold, with blue dots. A whimsical blue balloon shaped picture adorns the center of each table, while blue and white armless chairs made of woven wicker surround it. 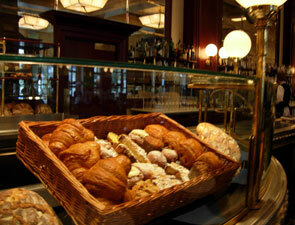 Bouchon's pewter bar is custom made and imported from France. It is completely versatile and perfectly comfortable for grabbing a quick Danish and an espresso in the morning, oysters - Bouchon is noted for its excellent fruit de Mare - and a glass of champagne in the afternoon, or even a pre-dinner cocktail or after-dinner aperitif. The bar area has several floor-to-ceiling mirrors that add to the area's elegance. Shaped like arches, the mirrors extend upward from the bar toward the ceiling, almost reaching it, and are separated from each other by rich, inviting wooden columns on which orbed wall-mounted lights sit. A clock hangs above the bar in front of the middle mirror, suspended from the ceiling. The decorative pewter itself lies on a base of dark wood. Striking flowers adorn the area. The same orbed lights that hang beside the mirrors also sit on cylinders throughout the bar, which itself has multiple levels of chrome and wood shelving on which to hold liquor. Over the clock area, suspended from the ceiling, is a square lighting fixture made of glass and lead, adorned on either side by thinner rectilinear lights. Below the lights, wooden chairs adorn the bar, along with tall round pub tables that dot the area. Finally, a partition separates the bar area from the main dining area; it is comprised of wood, which extends from the floor to the top of the pub tables, and frosted glass, which is decorated in a floral pattern and rises above the wood, framed within a larger, open chrome structure.